Are you in need of a robust, scalable, and secure Java Application that delivers a powerful user experience and needs to be launched on-time (and on-budget!)? You should consider MWIDM – a premier software development firm specializing in Java Application Design, Development and Maintenance with over 200 projects completed for web, desktop, mobile, enterprise and cloud deployment. MWIDM accelerates deployment of your Java application by tapping into a vast library of pre-built assets, reusable frameworks and ready-to-integrate code. With our in-depth understanding and expertise in Java technologies, we offer robust and high performance Java solutions. We help our clients select the right Java architecture and apply best practices and methodologies across various phases of the project lifecycle to design and develop secure and scalable Java applications. Our experience and proficiency spans highly scalable multi-tiered enterprise Java applications to standalone Java-based software utilities. We help enterprises and technology providers across all major industry verticals to build web, mobile, enterprise, and desktop Java applications that are secure and scalable. We architect & develop mobile applications in Java, with multi-device portability through Backend as a Service (Baas) enabled by RESTful APIs. We help you migrate legacy Java applications to the latest Java platform, incorporating new best practices for design, scalability and security. We provide UX/UI design services to develop powerful and consistent multi-device user experiences to drive user adoption, and engagement. Our Java expertise spread across frameworks, libraries, 3rd party tools, and web services etc. MWIDM’ Java practices ensure that we deliver integrated, powerful, and cost effective solutions tailored to your business needs. 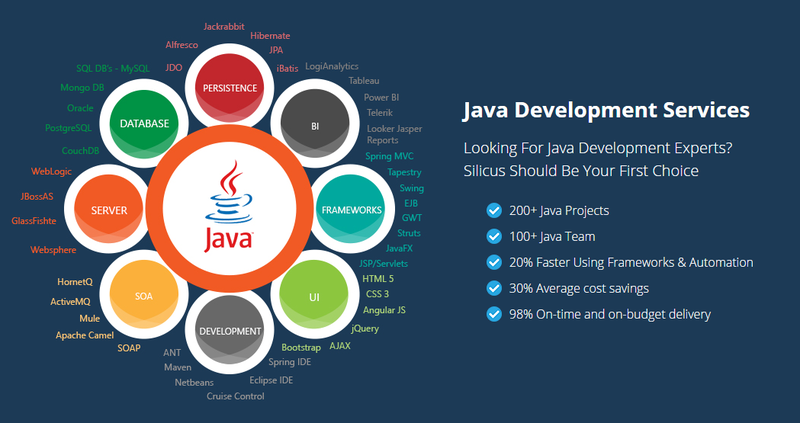 We Have Successfully Completed Over 200+ Java Development Projects. We Have Developed A Repository Of Java Best Practices – Including User Interface, Caching And Resource Management, Performance Tuning, Debugging, Testing, And Web Services To Accelerate Development And Achieve Cost Savings. Why Use MWIDM for your Java Software Projects? MWIDM brings deep technology expertise and proven experience meeting complex requirements for enterprise projects. Our Java development team features 100+ (and growing!) architects and developers engaging with clients across North America. Our teams leverage reusable frameworks, ready-to-integrate code, pre-built assets, and delivery best practices to accelerate development and deployment timelines by 20% on an average. Our flexible engagement model that is supported by our global delivery teams is tailored according to project requirement to optimize resource costs while exceeding performance expectations. This enables around 30% cost savings for Java projects. Our proven and mature processes derived from our experience of delivering 100+ successful Java projects across 16 years – results in 98% of projects being delivered on time and on budget. Application developers are no longer being thought of simply as order takers on the receiving end of requests. They are becoming full-fledged strategic partners and permanent value enablers with vested interest in the success of the business. MWIDM provides Custom Application Development services to help you make this transformation. We have formulated structured methodologies around our capabilities in application development to define and deliver these custom services. Our methodologies provide service improvements while reducing development costs, and also enable business transformation through structured business-centric innovations. Our approach to Application Development is based on a process framework called ABuild®. This framework is built on better practices from industry process standards, including CMMi, ISO, and ITIL. It also incorporates our own wealth of experience in developing applications for Global 2000 customers. Our Application Development methodology follows a risk mitigated and phased-based approach to define, plan, transition, and deliver services. Each phase starts with well-defined objectives and acceptance criteria and doesn’t end until customer signoff. We support varied development models, including Waterfall, Iterative, and Scrum, across all disciplines; technology guidance across applications developed on multiple platforms, such as Java, Microsoft, and Mobile; and better practices for integration, Service Oriented Architecture, and Cloud based development. Institutionalized mature software engineering processes based on predictable and repeatable performance in projects. Formal defect prevention process that helps minimize common defects in software. Delivery Excellence (DE) group that oversees delivery across all verticals and is dedicated to monitoring and streamlining operations for efficiency while maintaining effectiveness. Automated tools and processes for time tracking and project management that facilitate metrics-based management and cost control. Center of Excellence that works in tandem with DE to define and refine processes and provide technical guidance. Java is the leading language of choice. – Due to a global enterprise need for platform portability, flexibility and scalability, availability of vast open source resources combined with the maturity and stability that the technology offers. MWIDM’s deep experience in Java frameworks, web services, scripting languages and UI design combined with our flexible development approach enables you to focus on your business and technology needs while we take care of development. Think of us as your extended technology team. MWIDM’s development expertise includes complex web application development, SaaS enablement, customization of existing Java applications, features and performance optimization, system integration, and technology migration spanning domains such as insurance, ecommerce, finance, hospitality, medical devices and healthcare. Data and content manipulation is carried out in the persistence layer, along with integrating the database to application logic and workflows. A persistence layer helps to achieve stable performance and interoperability using WSDL, UDDI, SOAP, XML/XML Schema and HTTP specifications. Object-relational mapping enables easier decoding and code maintenance, saving time and effort, application flexibility to accommodate code modifications, replacement of underlying database, and the access mode with minimum effort reusability with multiple apps accessing the same database code, and quick development by division of development tasks. MyBatis, and MySQL as well as native Java capabilities such as custom ORM programming, JDBC, JPA, JCA, and JPQL. The business logic layer is where the entire processing takes place before data is sent to the presentation layer. Isolating this layer from other application code leads to improved performance, easy configuration and maintenance, scalability, reusability, extensibility and robustness. Our teams work with you to gather and analyze business requirements before designing and developing the business logic layer. We follow standardized processes and methodologies to collate information and document code. Our in-depth knowledge of SOA and ReST web services architecture enables us to build code that conforms to SOA integration principles and JBI specifications. Our in-depth expertise in jQuery, AJAX, JSF, GWT, Flex, and Spring frameworks help us to deliver intelligent and easy-to-use user interfaces for customer applications. By incorporating innovative and intuitive display elements that support dynamic data visualization, context driven controls, cross-platform layouts, etc., our teams overcome the challenge of rendering sophisticated, interactive and user-friendly UIDs while hiding the business complexity inside.